Birthdate : 4 January 1931. Birth Place : Machilipatnam, Madras Presidency, British India. 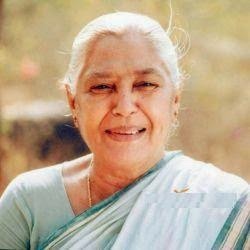 Died : February 19, 2009(Hyderabad, India). Occupation : Actress and Producer. Famous Films : Paaduka pattabhishekam, Kula Gothralu, Ekaveera, Shankarabharanam, Chillarakottu Chittamma, Patnam Vachchina Pativrathalu, Mugguru Monagallu, Oka Radha Iddaru Krishnulu, Naku Pellam Kavali, Chinnodu Peddodu, Gundamma gari krishnulu, etc. Awards : Nandi Award for Best Character Actress, Nandi Award for Best Supporting Actress. Nirmalamma was a very wonderful personality. Through out her film career she played a tremendous role in all fields such as comedian villan heroine drama and also in all types of negative and positive roles. She was very honest to her work. Any of her tremendous films when comes in mind all make us happy sad and proud. All her movies makes her a very huge personality. She always did the full disambiguation with all her roles offered to him. She was also very successfull in both her social and her personal life. Her name will remains in golden words always in bollywood history. Recent Tag : Nirmalamma Biography, Nirmalamma life history, Nirmalamma films, Nirmalamma details, Nirmalamma Best movies, Nirmalamma birth detail, Nirmalamma of birth, Nirmalamma image.